It did take a while before I finally got myself to drop my regular beauty regimen for Clean & Clear Active Clear Acne Control Kit. When the beautiful people behind this product sent this to me last month, I actually thought it was a beauty regimen for men, because of the metallic packaging. And as you beautiful people know, I am not exactly a fan of regimens that consist of me having to do several steps. 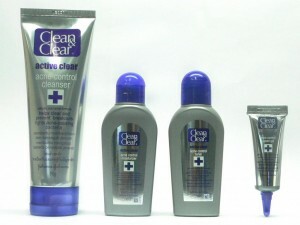 Clean & Clear Acne Control Kit does take you into a regimen with my dreaded several steps. In all my years, I have never used a toner once! I am more of a facial wash and then one time application of something, then I’m off to bed. Alas, last week, a nasty looking pimple erupted on my forehead, a day after it became three. Truth be told, I found myself using Active Clear Acne Control Speed Gel at first. I told you, I am just too lazy to go through the whole regimen. But when I saw for myself that the almost cystic like pimple on my forehead literally flattened out the morning after, I just had to give the whole regimen a shot. I am almost into my whole week now and I can only vouch that Clean & Clear Active Clear Acne Control Kit’s big claim of 100% of People Saw Clearer Skin in Just 1 Day is oh so true!